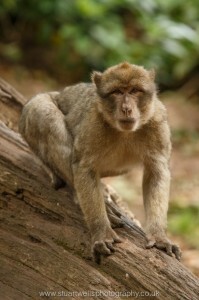 Barbary Macaques are native to the Cedar forests of the Atlas mountains in Morocco and Algeria, and once roamed wild across southern Europe and north Africa reaching out to Tunisia and Libya. But due to deforestation, logging and persecution from local farmers, the wild population of the Barbary Macaque has been reduced to just over 12,000 in the wild. In 2009 IUCN classified the species as endangered and added them to their IUCN Red list. Today the Rock of Gibraltar is the only home out side of the Atlas mountains where 230 individuals run wild. However… The Trentham Estate in Staffordshire UK is home to 140 Barbary Macaque monkeys, although in captivity, roam freely among a 60 acre woodland they can call home. On our way home from a family wedding in Derby, we decided to divert across to Trentham to take a walk in the woods among the Macaques. After walking through the gates to the forest, it was not long before monkeys could be seen playing and chasing each other throughout the trees. The forest plays a vital role in bringing awareness and education to the UK public of these endangered species, and runs breading programs to help re-introduce this animal back into the wild where possible. Within the forest the 140 individuals have divided into Two troops. The oldest female within the forest is 25 years old and the youngest just a few months old. Paths throughout the forest lead you down from the gate to a flat open area, winding up to the top of a hill before a descent in to a small valley and stream, this then leads you back round to the open space at the start of the forest. The monkeys run completely free within the 60 acres and can be seen all over the forest. Watching the monkeys go about their daily business can be quite amusing, they are extremely social animals and have many different expressions. Moods within the troops can change instantly and fights within the troop can break out right at your feet. Although we only spent a few hours in the forest, it would be quite easy to spend all day walking around and watching the Macaques… We shall return for a full day in spring next year!